They are designed for a wide range of processing applications and for use in manufacturing facilities. Combined with Variable Frequency Drive (VFD) electronic flow adjustment, Model P200 metering pumps with new gearboxes provide precise, accurate flow throughout the turndown range at up to 81.0 gph (255.4 lph) at pressure ratings to 350 psi (24 bar) for non-metallic pump heads and 1000 psi (69 bar) for metallic pump heads. The separate gearboxes also allow for versatility in changing applications and to prevent cross-contamination of actuating hydraulic oil. 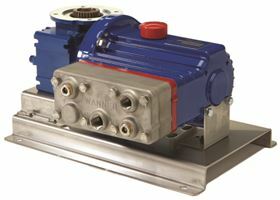 Model P200 pumps feature a multiple-diaphragm design that minimizes pulsations, producing smooth, linear flow without the need for expensive pulsation dampeners, Wanner Engineering states. A replenishment valve in every piston assembly ensures optimum actuating oil on every stroke for continuous accuracy. The seal-less design of Hydra-Cell means that there are no seals, cups, or packing to leak, wear, or replace. Spring-loaded, horizontal disk check valves and the seal-less design enable the P200 to handle viscous fluids and abrasive particulates up to 200 microns in size. Hydra-Cell Metering Solutions pumps can also run dry indefinitely without damage to the pump and are available in a wide choice of pump head, valve, diaphragm, and o-ring materials. A variety of options and accessories (e.g. pressure valves, calibration cylinders, motors and controllers) are available with the new model P200 to provide a complete chemical-feed pumping system, according to the company. The new ‘Control Freak’ touch-screen metering controller is also available with the P200. Control Freak features an easy-to-use touch-screen display and built-in programming to provide motor speed control for Hydra-Cell Metering Solutions pumps, the company says.